I am writing this post to cheer myself up. 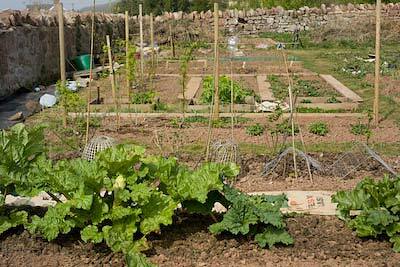 I’ve been busy knocking my allotment into shape for the growing season ahead and I think I’ve overdone it. Somehow no matter how much I dig and how many hours I spend trying to get through the jobs on the list, they just never get all ticked off. I’m the same with decorating the house. It is only once the job is completed that I feel the slightest glimmer of hope. So with still loads to do I decided to look back to see how far the plot has come since I first wrote about it here on my blog in October 2009. Looking at my original ‘before’ pics is helping me recharge so I can get out there some more. I set out to plant a garden specifically with preserving in mind, so the bones of the plot are my fruit bushes; blackcurrants, gooseberries, white, pink and red currants, strawberries in abundance and rhubarb even more abundant. There’s a row of blueberries as well as raspberries and angelica, a mirabelle plum tree and an old English greengage. So the second season begins on an optimistic note even though I am momentarily gloom and doomy. Thing is there is still a whole lot needs to be done. I’ve ordered asparagus crowns so their patch needs to be well and truly weeded and ready when they arrive in the next few weeks. 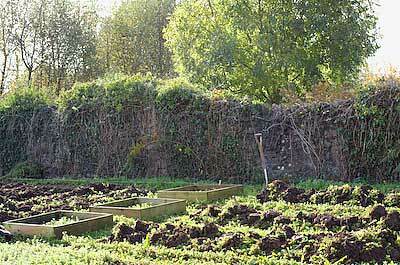 The stone wall that bounds two sides of the plot has been cleared of ivy and I plan to plant along it, with some espaliered fruit trees, like apricot, fig and cherry along the top edge, where the most sun reaches. The ground along the wall is full of the roots of the ivy, nettles, ferns, ground elder and brambles, so the clearing out involved is quite exhausting and I’m impatient for it to be sorted so I can plant this season. That is the part of gardening that does my head in, learning to be patient and accepting the limitations that time allows. I’m quite pleased with the layout of the plot. The beds are all rectangles and squares made up as I went along, so the look is quite orderly but asymmetrical at the same time. I bought a job lot of old scaffolding planks last year intending to use them to edge the beds but I’m liking them laid down to form the paths between the beds with some hessian coffee sacks also covering some of the paths like fitted carpet. They’ve been pegged down with bent wire pins and will last for a year, hopefully longer, but in the meantime give the plot a nice tidy look and keep the weeds away. We have problems with rabbits and pheasants on the site, so you have to be on the defensive whenever anything is planted. Happily, there are fewer slugs and snails than I’ve ever experienced before. With April upon us, it is now time to plant some seeds to fill in the gaps around the fruit. I’ve got some straightneck squashes to sow, that I loved in bread and butter pickle last year, dill for more pickling and borlotti beans for drying. My garlic for pickling scapes is growing well and hopefully the rabbits won’t take a shine to it. The rhubarb is doing splendidly. I’ve harvested a few stalks already and will have more in the weeks ahead even though I need to go easy on the cropping as this is still early days. I think next year it will come into its own and again some patience is called for. Today I noticed there were a few flower heads starting to form, so it was necessary to cut them off so the plants don’t waste their energy needlessly. I have high hopes for the strawberries planted last year. Fingers crossed they will do well this year and the preserving pan will be ready and waiting when they do (and some will be consumed fresh as well of course). 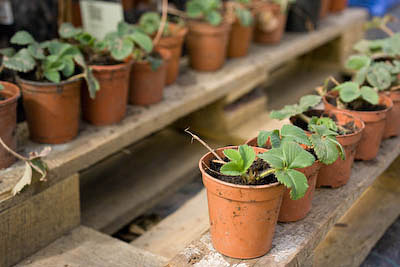 I haven’t finished weeding the second strawberry patch yet and already have plenty of little plantlets potted up ready for a new home in my garden. Well, I’m feeling cheerier already. I’d best get out there and continue with the digging. I know it is a lot of work and a lot of patience, but it seems so exciting to me. We have been on the waiting list for our community garden for years. The next person up for a spot has been waiting since 2003. Sigh… Enjoy all you have growing. Your garden looks lovely! I have a large garden space and frequently feel overwhelmed when what I see doesn’t match up with what I had hoped to achieve. Last year I started to assign time limits to working on certain areas so I could also spend some guilt free time doing other jobs I loved. 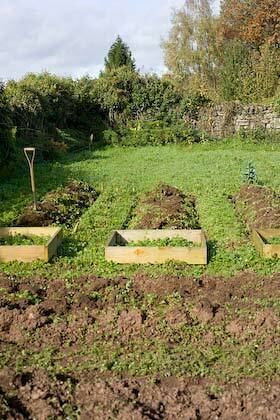 It worked like a charm…..
You’ve made a huge amount of progress in your allotment! What a difference exposing the walls made! It’s going to be a job getting out the old roots but well worth it for the espaliered fruit trees. Might want to shove some metal sheeting down into the ground along the front edge of the border to keep any roots out there from creeping back in. Ivy and brambles are notoriously hard to get rid of since any little bit of root left likes to come back strong! Persevere and Preserve! Your garden is wonderful! My yard is a lumpy, north-facing hill of clay running down to the river that gets almost no sunlight, so a few tiny raised beds in the relatively flat areas are the best I can manage for now. If we ever move, it will not be for the sake of a bigger house, although we could certainly use one; it will be for a more suitable gardening space! For now, I hope my envy/admiration will make your labors feel less laborious. I’m so looking forward to your spring/summer posts! PS Your posting title sounds like a Sherlock Holmes story. It all looks marvelous to me!! In fact, it is just what I needed to see to help get through the rest of the winter (we’ve still got snow) and gear up for another gardening season. I love the fact you garden with preservation in mind…you are my type of girl!! Looks wonderful! I hope you’re seeing just how far you’ve come now. 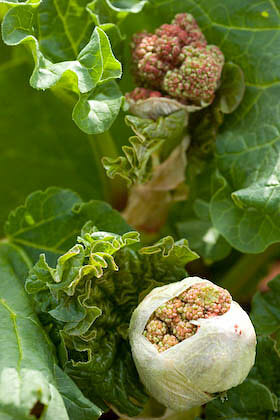 Looks pretty good to me for the time of year, Do you intend to force your rhubarb? the rose coloured stems are so tender and sweet when grown under an chimney pot or upturned dustbin. I remember a lovely pudding from my one visit to the River Cafe; pink rhubarb cooked with champagne served with a perfect vanilla pannacotta. I would leave out the champagne and add rose water. You are so lucky to have the walls as you will gain a few degrees of radiant heat for your espalier fruit. I recommend espaliered redcurrants… pruned correctly you can make them grow quite high, they need some shade in the day though. The figs are your best bet for hot walls. I’m just about the plant pea shoots in an old fruit box, they grow so quickly and make brilliant salads. 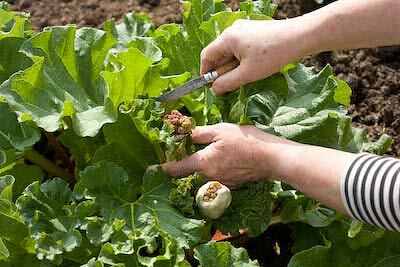 Beetroot are so good for preserving, there are so many varieties… try to grow the bolt free types, early bolting is one of the most dissapointing things that happens in a veg plot, it is a dissapointing end to all the expectation and promise of a healthy crop. The Italian type chioggia has concentric rings of pink and white… beautiful and delicious. Scorzonera with its coconut scented yellow flowers and tender white roots would a good canning veg. Its close relation salsify should be grown for the exquisite purple composite flowers that open at dawn at fade at midday. The roots are also good but thinner than scozonera. I would like to see a pic of the gardener in the garden… you will become one. Thanks everyone for such encouragement. I’m feeling a whole lot better already. And thanks Deborah for your expert advice and recommendations.I think scorzonera and salsify would need to be pickled to preserve safely without pressure canning. You’ve started me off on another research trail now. 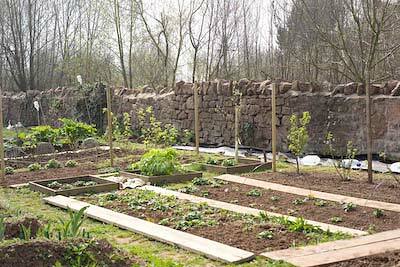 The long stretch of wall is east facing, so cooler, and would suit more redcurrants as you suggest. Also a Morello cherry should do OK there as well. Sour cherries don’t need such a hot wall as sweet ones.